Butterscotch Pie makes a wonderful dessert anytime. Serve butterscotch pie with coffee, take it to a pot luck or gathering or make one for a friend. This butterscotch pie is delicious and easy to put together. I love anything butterscotch and I could eat this one by myself. Your friends and family will ask for the recipe and you will make this butterscotch pie many times. If you like butterscotch, this pie will become one of your favorites. This is an old fashioned recipe that has been in my collection for a long time. I can remember my mother making this butterscotch pie. Bake crust and let cool. In a pot on top of the stove mix milk, sugar, cornstarch, egg yolks, vanilla and salt with a whisk. Add butter in one piece. Cook on medium high heat for 5 to 7 minutes until butter melts and mixture thickens. Stir constantly because this will burn easily. Once thickened, remove from heat and pour into pie crust. Start beating egg whites, adding sugar while beating. Add vanilla and continue until peaks are formed. Spread on pie covering entire pie. Bake in preheated 350 degree oven until brown on top or place under broiler to brown. Enjoy! Feel free to “share” with friends by clicking on the Facebook, Pinterest or Twitter icons below. You can print by clicking on the green icon with the printer inside below. When you say ‘Brown Sugar’ is this Soft brown sugar or Demerara sugar? I am in the UK. I really plan to give this a try! It is the soft brown sugar. My meringue was pretty when it first came out of the oven, it was stiff and had nice peaks but then shrank and turned watery over night. I let cool completely before putting in the fridge. Yes, I sure do, you can purchase it on the website. It is a dessert cookbook! We will have another cookbook out soon, that focuses on casseroles, slow cooker, skillet meals, etc. I made this for Easter and it tasted just like my momma’s!! So glad I found this keeper recipe!! This is one of my Favorites!! My Grandma made the Best Butterscotch Pie!! She used the double cooker to melt and mix her ingrediants in!! Miss those Days!! Best of all, was getting to clean up the Beaters!!! my mil made butter scotch pies and she would put sugar in a skillet and cook it till it was liquid and it did get hard but i tried it and threw the first batch out.i found out that you have to keep cooking to get the sugar that has hardened to dissolve. was lots of trouble but it really did taste like a butter scotch pie. this is much easier will give it a try.thanks for the rec. My mother in law made a pie like that and called caramel. Never did taste one. 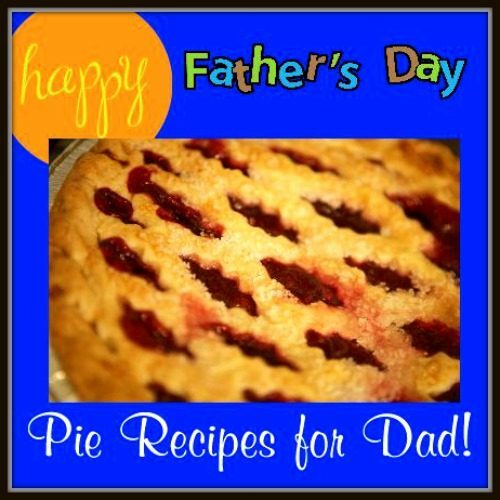 My daughter made one for her daddy last Christmas and it took me a long time to find a recipe for it. Loved loved loved as a child!!! My Mom used the butterscotch as the pudding in banana pudding! OMG SO good!!!! I highlighted the recipe with my mouse and then then I held ctrl key and the C for copy. I opened my Microsoft Word and I held the ctrl key and v to paste it in the word doc. Then I changed the size of the print and copied it. I saved it to my computer. You can also highlight WITH YOUR left MOUSE button –hold and drag along the area of what you want off the internet . Right mouse click on the screen page and choose PRINT when a list of items pops up–then choose selection and it will only print what you selected. It is much simpler to just click the Print/pdf at the bottom of the recipe. You can remove the photo and any text you don’t want and print just the recipe. I have been looking for my grandmothers Butterscotch pie for years. She died with Alzheimer’s taking her recipe with her. I have gone through flea markets looking at old cookbooks and trying every one that I have found. I will definitely be giving this one a try after seeing some of my other favorites on your website. Since you are a southern girl like me, I am hoping this is the one! Thank you for sharing! this looks like the one from the old bettery crocker cookbook that a lot of housewives have used through the years. I make their chocolate creme pie version. Do you delute the evap.milk? No, do not dilute the milk. Do not dilute evaporated milk with this recipe. There is a print/pdf button at the bottom of each recipe. You just click on that and you can remove the photo and any text you don’t want and print only the recipe. If you are trying to do this and it is not working, you need to get someone to show you how to do it. The button is working. Looking for a recipe for Buttermilk Pie… Do you have one? Yes, Joan, there is one listed on the site. Look on the right hand side of any page down the page a little ways. You will see photos that say, “Appetizers and Dips”, “Breads” Cakes and Cookies, etc. Click on the one that says “Pies” and you will get a list of all the pies on the site. Reduce sugar by 1/2 use 2 yolks. This reduces a lot of calories & (fat from eggs). I just made this and I done something Wrong. Doesn’t taste like butterscotch! Maybe I cooked it too long but removed from heat as soon as it started getting thick so not sure what went wrong. Will have to try it again. I love butterscotch pie so not giving up yet. 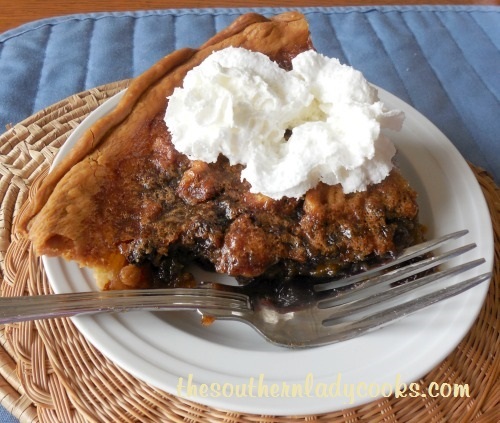 I have a similar recipe but it’s called “Brown sugar Pie”. I like to do these kind of pie filling in the microwave. Just have to start out at 40-50% power level for about 4 minutes take out and stir then do another 4 minutes and increase power level to 60% keep doing this till thick–increasing power level each time. This way you don’t have to stand over the stove and stir constantly but if you don’t reduce the power level you will have cooked eggs in your mixture. Oh, sweet Lord! I can’t wait to make this! Butterscotch is my favorite! Sharing this with my peeps at SYM too! Does this need to be refrigerated if not eaten completely after baking? Yes, I would refrigerate it. made this today…so easy but very scant amount…can the recipe be doubled for a greater amount of filling? I made this last night, and less than 24 hours later my family has made it disappear! Thanks for the simple recipe! I found it to be easy and just like my grandma’s in TN. I had to stay with it and continuously whisk it though, and know exactly when nirvana was reached with thickness and smoothness. Thank you so much Christy for trying this recipe. I am so happy your family liked it. Thank you for trying my recipes and being a part of my site. I made this yesterday. I’ve made many cream pies before but this did not turn out well at all. The corn starch didn’t all disolve but stayed lumpy. The taste was ok but it was so very thinck that you could lift it all out of the bowl in one lump. I didn’t make a pie but put it in bowls. My hubby wouldn’t eat it after one bite. So it was way too thick, and the cornstarch seemed to be way too much. I will not make it again. Had to throw it away. I cannot understand how this would’ve worked any better in a pie. Sorry. 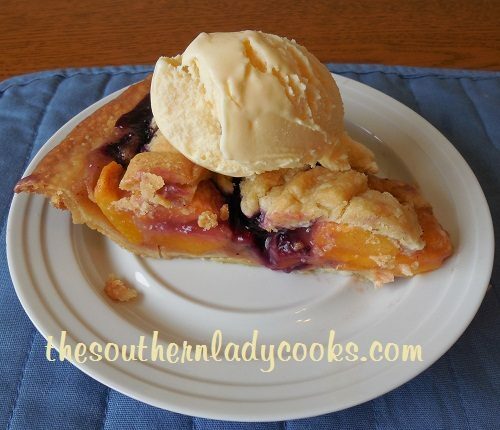 Hi Kathy, I cannot imagine what happened to your pie….I make this pie all the time and everyone loves it. You can see by my picture how mine looks. So sorry this happened to you. Sounds like you may have cooked it too long. Many times stoves vary in temperatures, too. My cornstarch stayed lumpy too. I think it might be out of date? I will try again! When I make a custard pie of any kinds I strain the mixture before I cook it and it turns out great. I made this yesterday, it turned out great!! 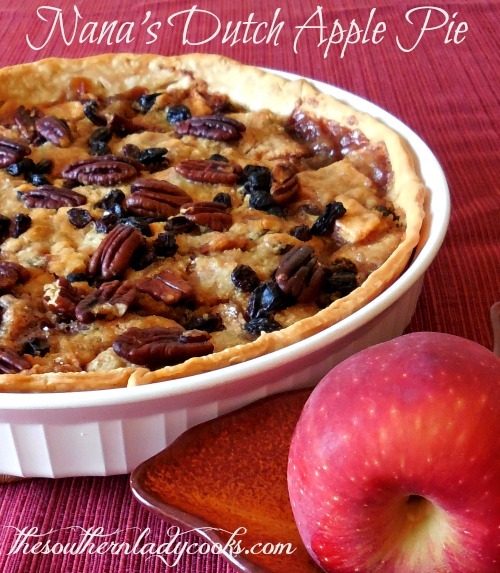 Next time I need to make two, you could have old ingredients, this is on my favorite pie list!! I am looking for a Butterscotch Pie that you have to “brown” your white sugar…Then make use the basic custard…..My Mother made them like 50 years ago…but would never show me how. Oh my goodness, this makes my mouth water just thinking about it. Unfortunately, I’m the only one in the family who LOVES caramel and butterscotch. But I’ll be making this one for just little ole’ me. Just think how I’ll feel after eating this whole pie by myself! YUMMY! I love this pie too. I have a funny story…Mom always thought that my dad liked this pie, so she made it often for him. After she died, I thought that I would make his “favorite” too. After he ate a piece he said, “You know, your Mom always made this pie for me, but I really didn’t like it.” I asked him why he hadn’t said anything and he said, “I didn’t want to hurt her feelings.” He went all those 60 some years without telling her….when he really preferred apple. That is so funny, Balisha! Hope you all are good. I stay busy with the site and the grandkids now that I have two! Butterscotch Pie is one of my favorites but my husbands is Coconut Cream. Do you have a good receipe for one? I am making this today. sounds wonderful and so easy. Must try this – I think your corn starch is the equivalent of our cornflour?? Plan on trying this. The last one we made had to be cooked in an iron skillet and kept 2 of us busy. Love butterscotch pie! Miss Judy! How did you know I have been looking for a great recipe for Butterscotch pie?! This just might be the one! Hi Sandy, I love this and so easy. I hope you like it, too.